Fur Flying in the First Nevada "Bundy" Trial | RANGEfire! 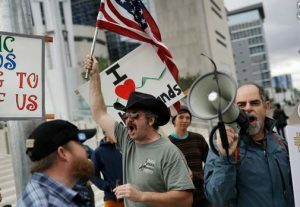 A downtown Las Vegas courtroom provided scenes as wild as a Western movie Monday when federal prosecutors and defense attorneys battled over nearly every piece of evidence presented in the trial against six of rancher Cliven Bundy’s supporters. Defense attorneys tried to block a government witness from testifying. A prosecutor invoked an evidence rule that led even the judge to flip open a legal handbook. A juror made a wisecrack that caused one lawyer to raise concerns of potential bias. By 4 p.m., U.S. District Judge Gloria Navarro had sent the jury home early and told them not to return until Wednesday. The day’s most hotly disputed footage was played outside the presence of the jury when defense lawyer Todd Leventhal tried to bring into evidence a video from the April 2014 standoff in Bunkerville. The video was captured by a Fox News cameraman, and Leventhal, who represents Bundy supporter O. Scott Drexler, wanted the judge to let him play it when he cross-examined Bureau of Land Management Ranger Gregory Johnson. Johnson testified as a government witness Monday. On April 12, 2014, he was recorded on dashboard camera footage using a megaphone to repeatedly order protesters to disperse. The cameraman was identified in court only by his surname, Lynch. Defense lawyers tried to use the footage he captured to bolster their arguments that protesters could not understand law enforcement’s instructions from 200 yards away on a windy day. On the video, Lynch walks toward the cattle impoundment site where federal authorities were headquartered. “You are in violation of a U.S. District Court order,” Johnson’s voice boomed over the megaphone. “I am the press!” Lynch shouted. Navarro would not allow the video into evidence Monday, but she told Leventhal he could play it for jurors if he calls Lynch as a defense witness. The drama intensified Monday when Assistant U.S. Attorney Nicholas Dickinson, questioning the witness for the second time, declared that he was invoking an evidence rule to publish notes from an FBI interview with Johnson. The interview first was referenced by defense attorney Jess Marchese, who tried to suggest that the witness exaggerated in about the threat level in his trial testimony. Dickinson asked Johnson to read directly from a line in the April 2014 FBI report. When Johnson finished testifying and prosecutors called their next witness, defense attorneys responded furiously because Sgt. Tom Jenkins of Las Vegas’ Metropolitan Police Department was not on the original government witness list. Judge Navarro allowed Jenkins to testify under direct examination, but she canceled testimony in the trial Tuesday to give defense attorneys an extra day to prepare for cross-examination. The jury was shuttled in and out of the courtroom during Monday’s legal wrangling. Their expressions displayed both laserlike focus and utter confusion as they watched the heated but legally dense disputes unfold. Before Jenkins testified, the judge asked jurors whether they recognized him. His joke drew chuckles, but also a challenge from Leventhal, who asked the judge to bring the juror in for questioning Thursday.